They slice. They dice. Is there anything modular instruments can’t do? My recent column Prediction: Microwave coming to PXI – big time! has caused the most essential engineering question to be asked of me, “Are there any measurement limits to modular instruments, such as those in PXI or AXIe?” Or, put another way, is there some frequency too high or signal too small that a modular instrument can’t make the measurement? A frequency too high? No. A signal too small? No. In my column here, I explain how engineers have destroyed the predictions of modular instrument limitations. Other than power constraints due to finite air cooling of modules, there are very few true technical barriers to modular instrumentation. You can thank an engineer for that. NIWeek is National Instruments’ annual conference held every August in Austin, Texas, attracting some 3200 attendees. Flying from the cool mountains of Colorado, the Texas heat slapped me in the face as I stepped off the plane. Pro tip: Don’t pack any jackets or sweaters if you come to NIWeek. In fact, don’t even pack long sleeve shirts if you plan to walk to the convention – or anywhere else! When you are in Austin in the summer, survival requires scurrying in the open sunlight as little as possible. The goal is to arrive at the NIWeek keynote each morning without looking like you just stumbled across the Sahara. This blog examines the test and measurement industry from an architectural and business perspective, with a particular focus on modular instrumentation. NIWeek is always a revealing conference as NI unveils new products and applications. You can read my in-depth coverage of the Nokia/NI 5G prototyping system, demonstrated at NIWeek, here. Admittedly, saying all of NIWeek can be reduced to the above LabView RIO (reconfigurable I/O) diagram is a bit of hyperbole. But just a bit. NI’s major announcements orbited around this diagram, as does much of their partner strategy. To take a deeper look, read my complete column here. This year I have a special interest in 5G communications. Frequent readers of Test Cafe blog know that I have recently written about 5G, and why modular instruments are well positioned architecturally to address the challenges of 5G. Architecturally yes, but without the mmWave (millimeter wave) instruments needed for the highest frequency 5G microwave bands. My most recent column made an unequivocal prediction: We will see modular microwave, and mmWave in particular, within 18 months. That is, by the end of 2016. Perhaps I should have said 18 days. As part of the Day 2 Keynote presentation at NIWeek, Nokia and NI demonstrated a “5G” 10Gb/s wireless link operating at 73GHz, architecturally based on PXI and LabView. 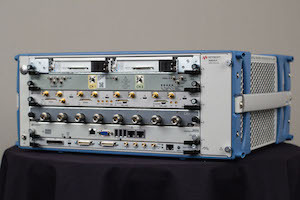 For completeness, I should mention that Keysight Technologies had just announced a 5G channel sounding reference system, based on PXI and AXIe, a week earlier. I should have bought a lottery ticket the day I made that prediction! I hope to cover the Keysight system in a subsequent column. Today I will focus on the Nokia/NI system. You won’t find any press releases or data sheets about the NI products behind the Nokia system. They are yet to be released as generally available products. However, NI was more than happy to showcase the system and describe how it operates. Prediction: Microwave coming to PXI – big time! Well, I’ve been watching these items. From the trends I’ve seen from the first two topics, I’ve come to the conclusion that there will be more, much more, PXI microwave in the near future. Prediction: By the end of 2016 we are likely to see PXI instrumentation up to the 60 GHz range, and we may see it sooner. 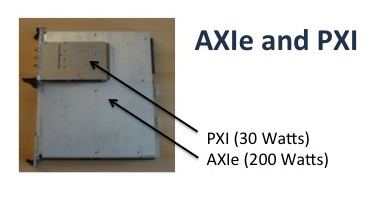 How many modular instruments (PXI and AXIe) are currently servicing the mmWave range? Why is that? Are designs at these frequencies that much more complex, making it difficult to achieve in a modular architecture? Yes, higher frequencies result in more challenging designs, but that isn’t the root cause of the lack of mmWave instrumentation. The real root cause is that the fastest growing segment of the modular instrument market has been wireless communications, and those applications are anchored at 6 GHz and below. Therefore, this lower frequency range gets the bulk of the industry investments. Now, all this is going to change…read the entire article here. Merger-mania: Has test and measurement gone MAD? Keysight acquiring Anite. Teradyne acquiring Universal Robotics. Cobham acquiring Aeroflex. Danaher splitting in two, divesting Tektronix. Has the industry gone MAD? Yes, but not crazy mad or angry mad. MAD, as in mergers, acquisitions, and divestitures. The pace of MAD has recently accelerated. You can be forgiven if you feel you need a scorecard to keep track of the brands and products. This column traditionally covers instrument architectures and industry moves. There are no bigger moves than mergers, acquisitions, and divestitures. I will give the low-down on four of them. So with that in mind, let’s look at the recent MAD activity, starting with Keysight and Anite. If you’ve been reading about modular instruments, or speaking with one of several vendors that offer AXIe-compatible products, you may have come across the term “AXIe”. What is it? Where is it used? How is it different, or similar, to other instrument standards? How does it compare to PXI? If so, you’ve come to the right place. These are the questions I aim to answer in this introduction to AXIe. AXIe is a multivendor modular instrument standard. Here, an AXIe chassis is shown with AXIe modules from Cobham (Aeroflex), Guzik, Keysight, plus PXI modules via an adapter. The coming 5G wave is set to not only disrupt the communications sector, but also the test equipment that serves it. While some traditional instrument product categories may be utilized in the development of 5G, the real heavy lifting will be performed by instrumentation not yet invented. The combinations of frequency, spectrum width, data rates, and multi-antenna architectures are simply not present in today’s instruments. But one thing is clear: modular instruments will play a primary enabling role for 5G. Modular instruments, those based on PXI and AXIe, are well positioned to play a major role in the definition, design, manufacturing, and deployment of 5G systems. In fact, I make a bold observation: if you are a test vendor, and don’t have a modular strategy, you won’t be playing a serious role in 5G. To see what 5G is all about, and why modular form factors are a good match, read the entire article here.